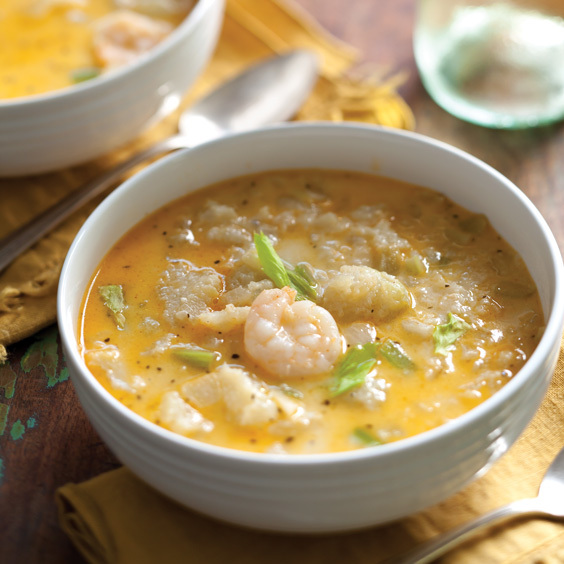 This creamy mirliton and shrimp soup is a holiday classic. To a large pot, add mirlitons and enough water to cover. Bring to a boil, and cook until fork-tender, about 45 minutes. Transfer mirlitons to a colander, and let stand until cool enough to handle. Remove and discard seeds and fibrous membranes from mirlitons, and scoop out as much flesh as possible. Place flesh in a large bowl, and mash until smooth. In a large Dutch oven, heat pecan oil and butter over low heat until melted. Add onion, celery, and mirliton; cook until onion is soft, about 8 minutes. Add garlic and shrimp; cook for 2 minutes. Stir in peppers, salt, ginger, and basil. Add fl our, stirring well. Stir in broth, and bring to a boil over high heat. Reduce heat, and simmer, stirring occasionally, for 30 minutes. Remove from heat, and add half-and-half. Serve immediately. I used the black, white, and cayenne peppers. The soup is spicy. If you prefer less spice, you may want to add the pepper(s) after the half and half or just eliminate one. This was pretty good – I am from New Orleans and I am used to making stuffed mirlitons and this was very similar minus the breading/carbs. I didn’t mash my mirlitons thoroughly but left many in a small dice.I added extra spices and it was really delicious. I wish this squash wasn’t so hard to find or so expensive. I remember my grandma grew them on a vine in her backyard so we always had them. We always ate the boiled seeds when momma cut them up for the casserole. I was wondering if some small diced potatoes and or carrots might work in t his dish to give it some heartiness. Anyway it was indeed delicious! Thanks. Have you tried shrimp and milliton casserole? I’m from the Westbank and it’s always a favorite. Add a little turkey gravy on top and it’s heaven. Mirlitons, are usually priced at three or four for $1.00 around the peak of their season, December through March. If you cannot find mirliton, Try a different member of the ‘squash’ family. Squash is very versatile. Very cheap this time of year, 4 for $1.00. Buy extra for freezer to have when you want them. What can you substitute the pecan oil with? I can’t find this in my small town. Thanks for asking! You can substitute any neutral oil (such as canola) for the pecan oil. In this specific recipe, a mild olive oil would also work. I’ve made this on more than one occasion and have gotten nothing but rave reviews! Mirlitons are seasonal but I buy when plentiful, boil, peel and freeze them until needed. I make a merliton casserole for Thanksgiving and Christmas. For this dish I boil them in a little crab boil. Great taste. 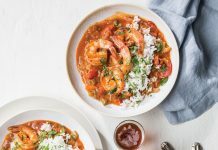 You could freeze this, but here’s why we wouldn’t recommend it: after defrosting, the texture of the shrimp will not be quite as good, and the half-and-half may have an off-texture. Couldn’t you freeze it without the shrimp and half-and-half and just add that in when you heat it? It was delicious!! I added some Tony Chachere’s to it. I’m going to try adding a little crab boil next time like another person suggested. It was a big hit with my family! Thanks!! That would be the best way to freeze it. We’re so glad your family enjoyed it! I am from south Louisiana and I really want to try this. My thoughts are that adding the shrimp later in the preparation might work well. I don’t like to cook shrimp too long they can be overcooked very easily. What I was thinking on doing was fix it as directed, except add seafood base (broth) instead of chicken. Then saute the shrimp in a little butter separately, before adding it to the rest of the ingredients. I think the flavours would blend well. Where can I get pecan oil? OMG! I love chayote! Would crab meat or sausage work in place of shrimp? I need to substitute something due to an allergy. My family loved this soup. it was east to make and taste wonderful. i made this today and substituted the shrimp for crawfish I also added petite diced tasso for a smokey flavor WONDERFULLY delicious! Thanks for this awesome recipe! 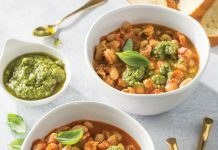 Easy prep and oh so delicious! 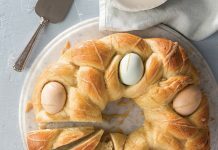 I’ve made this recipe year after year and everyone always loves it! I’m from New Orleans and we love this! Thanks for this great recipe. The recipe says 10 servings, what size are the servings? Hi BC! Generally, a bowl of soup is about 1.5 cups per serving. I am from the south now live in MO. Hard to find Chayote here but make due with traveling to larger city. Question is 8 whole mirlitons halved or eight halves? Hi Jane! This is 8 whole mirlitons, then halved. Happy hunting for chayote! I made this soup for Thanksgiving! Is was delicious. I also added crackers and used canola oil instead of pecan oil. Thanks for sharing your recipe! Big, big hit with whole family! Some kids found it a bit « hot » with all peppers but loved it anyway. Since I am from Canada, I could’t find any « Wondra quick-mixing flour » so I used instead « Robin Hood easy blend flour » which is the same thing. This recipe is a « do it again » ! !